Batik Fabric was born in Indonesia, but now the garment can be found in almost every corner of the world. What is batik fabric? Batik is more a process to make artistic garment than the product itself. Etymologically, batik is derived from Javanese terms amba, which means to write, and titik, which means dot. The art of batik thus involves writing dots, lines and curves on a piece of fabric using a tool called canting to create certain patterns and motifs. Although the term originally refers to the process of making, today people know it more as a product than a process. Batik fabric, as both a process and a product, has gone transnational know. As a process, with so many variants of patterns, motifs and techniques, batik is no longer exclusively Indonesian. There are currently many countries that produce their own versions of batik. Even the process of making Mandiba, the garment regularly worn by Nelson Mandela, is widely known as batik. As a product, batik remains more or less exclusively Indonesians. The UNESCO has chosen Indonesian batik as a Masterpiece of Oral and Intangible Heritage of Humanity while insisting Indonesia as the preserver of this heritage. In this article, we will go through a deep exploration of this cultural heritage. We will look into its history, various batik techniques, various versions of batik, and different types of fabric used for making batik. Batik fabric is a resist dyeing process in which batik artists draw a negative on a piece of fabric that makes the part will not be dyed later. This process has been occurring for very long in human history. The first recorded instance of this process occurred among the Egyptians and some tribal communities in Africa; however, the process was slightly different from the one that would later emerge in Indonesia because Egyptians used scraping technique after waxing whereas African communities like Yoruba, Wolof and Soninke used cassava starch instead of beeswax. Where did batik come from? The earliest known batik process that was relatively similar to that in Indonesia was recorded in China, India and Sri Lanka. The process involved drawing negatives on fabric so that when the fabric was later dyed, the drawn parts were untouched by the dye. This process was later adopted by different communities along the trade route passed by Chinese and Indian traders, including those inhabiting the Indonesian archipelago. What makes Indonesian batik unique? There are two reasons why in later periods, batik is considered an art exclusive to Indonesia. First, although the art itself might be brought by Chinese and Indian traders to Indonesia, the batik style that later grew in Indonesia became so exotic and unique that Indonesian batik was known among traders to be a masterpiece that was elevated by Javanese royal family. The special characteristic of Indonesian batik was particularly because all materials to make state-of-the-art batik fabric, including beeswax, high-quality cotton garment, and various dyeing materials, were widely available in Indonesia. Second, some scholars, including J.L.A. Brandes and F.A. Sutjipto, believed that batik was actually not an art transmitted from South and East Asian people, but a native art developed by native Indonesian people. This was particularly because in regions without direct Chinese and Indian influences, such as Toraja, Papua and Flores, the art of batik was also flourishing. This becomes one of the primary rationales for Indonesians in the modern era to claim that the art of batik is exclusively Indonesian. In the beginning, batik fabrics were only worn by Javanese royal families. The active development of batik became the focus the Sultanate of Mataram, during which batik was worn by the King, his family and the nobles. This tradition was not only preserved, but also invigorated during the era of Surakarta Sunanate and Yogyakarta Sultanate, giving rise to the distinction of batik design in each region. This marked the development of Solonese batik and Yogyanese batik that continued until today. There are many factors that distinguish both styles of batik. To begin with, Yogyanese batik uses patterns and motifs that look strong, sharp and masculine whereas Solonese batik uses calmer, softer and milder patterns and motifs. Both styles are also different in that Solonese batik uses darker backgrounds, such as brown and brownish gold, whereas Yogyanese batik generally uses brighter colors, especially white, as background. Lastly, they are different in the way the parang (sword or kris) motif is drawn on the fabric. Solonese batik uses parang motif that is drawn from top left to bottom right whereas Yogyanese batik uses parang motif that is drawn from the top right to bottom left. In later period, batik fabric became so popular that the tradition of batik making was later adopted and practiced by the hoi polloi. As a result, various styles of batik, such as those from Pekalongan and Banyumas, later emerged. Despite the growing variation of batik styles, the ones from Surakarta and Yogyakarta still became standards until today. Today, batik fabrics with modern motifs are available. Although traditional motifs, such as Parang Barong and Sido Mukti, are still preserved, additional motifs that are never included before, especially those that symbolize modernity, are now added to the design. Being transregional and transnational, even Solonese and Yogyanese batik styles that have become standard in batik making, started to adopt design not only from other regions in Indonesia, but also from other nations on earth. This is the reason why batik is now popular not only among Indonesians, but also among foreigners, including world-class personalities like Julia Roberts, Jackie Chan and Kate Middleton. Based on its etymology, batik is basically an art of fabric drawing that involves the use of canting to draw dots, curves and lines on a piece of fabric. Although this traditional technique is still preserved and regarded as the “genuine” way to make high-quality batik fabric, alternative techniques are also available due to the advancement of technology and fashion demands. Here are the most common batik techniques that you should know. Hand dyeing is the most traditional technique to make batik fabrics. This technique involves the use of canting to draw various patterns and motifs on a piece of garment with melted beeswax as the ink. Canting is a small teapot-shaped pen that is made from lightweight copper. To use it, it must be filled with melted beeswax using scooping technique and then the artist draws on the fabric by discharging the wax through its tiny spout. A canting can have one or two spouts, the latter are useful for drawing parallel lines. Besides canting, paintbrush can also be used to cover larger drawing area. This process takes long time to finish because even skilled batik artists have to draw the patterns and motifs slowly. The temperature degree of the melted wax is an important factor to mind during the drawing stage. If the wax is too hot, it may damage the fabric, emit dangerous fume and even catch fire. If it is not hot enough, the liquid wax may not penetrate well through the fabric. In most cases, the wax will stay on a small frying pan that is constantly heated by a small stove underneath it. The fire emitted by the stove is carefully controlled to maintain appropriate wax temperature. The appropriate temperature degree to keep the wax usable for drawing is about 110°C to 115°C. After the drawing stage ends, the entire fabric is immersed in dye liquid to colorize it. Traditionally, the dye is made from wood fiber, morinda or noni, copper pod, and soda ash. Today, synthetic fabric dye is also widely used especially at places where access to natural dye ingredients is limited. During the immersion process, the drawn parts will not be touched by the dye because they are protected by the wax. The dyed fabric will then be dried to allow the dye to merge with it. After this dyeing stage, the fabric is immersed once again in boiled water to remove the wax. Ironing might also be needed to further remove wax residue. After this dipping and ironing process, the fabric will reveal the drawn patterns and motifs in white or in any color used as the fabric base color. In the modern time, wax is not necessarily used. Washable resist medium is now available for purchase. Using this medium, the process is simpler and shorter because the removal of the medium can be used using microwave. In general, stamp dyeing is almost the same with hand dyeing, except that instead of using canting, this technique uses stamp dipped in melted wax to draw repeating pattern. Stamp dyeing is considered a preferred technique to draw batik motifs and patterns because it expedites batik making process without sacrificing the genuineness of the process. Stamp dyeing technique generally proceeds in the same stages. It begins with drawing stage using stamp and then proceeds with dyeing, dipping, and drying stages. When a large straight line or seam is desired, tie dye is mostly used. In this technique, the fabric is folded and then tightly bound or taped. Afterwards, it is dipped in dye to give it color. When the fabric leaves the dyeing liquid and then it is dried and unbound, its entire surface will be colorized, except along the area that is previously bound or taped. The result is a straight white line that stretches from one side of the fabric to the opposite side. Painting technique is distinct because this technique doesn’t involve drawing negatives. Instead, it involves drawing real image with real color on the fabric. 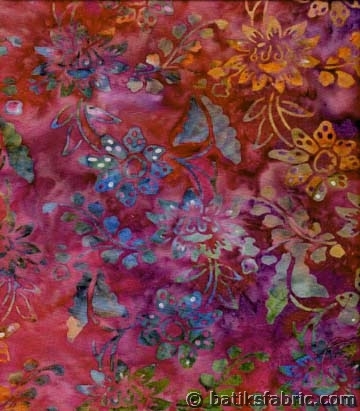 This technique can be done on a plain sheet of fabric to create original painting or a finished batik that is made using hand dyeing or stamp dyeing technique to add additional layers of patterns and motifs with different colors. If the white patterns and motifs of hand-dyed batik are to be made colorful, the artist may colorize the white spots with any colors they like using paintbrush. In Indonesia, this technique is known as colet technique. Screen printing technique is a relatively new technique that becomes popular since the technique itself was invented. Screen printing technique allows fast process of making batik because artists basically only need to prepare the screen medium with batik patterns and motifs already imprinted on it. The stencil for the batik patterns and motifs can be made by hand or using an electronic printer. Screen printing is favored among wholesale sellers because it allows fast production of batik fabrics, but among traditional batik enthusiasts, this technique is disliked because it deviates from the traditional “genuine” way to make batik and because screen-printed batik fabrics are less durable than those made using traditional technique. A more advanced technique called digital printing technique is also available. However, at the moment, this technique is not very popular because the used coating ink completely eliminates the breathability of the fabric and because the product of this technique appears very unnatural (too rigid and too glossy). This is particularly a new technique in batik-making industry; however, the technique is not actually used for making batik. Instead it is used to make a new product using patches of batik fabric. Batik quilt may use either patchwork or applique technique, the former is useful for making repeating patterns whereas the latter is useful for making custom shapes on the quilt. Quilting technique can be used to design various styles of batik, but it becomes very popular especially in Bali, where batik quilt becomes favorite merchandise for both domestic and foreign tourists. Besides the Yogyanese and Solonese batik styles, which are also called inland batik styles, which we have explained above, there are also other popular batik styles that are available in Indonesia. These include batik styles that are produced in coastal regions in Indonesia, including Cirebon, Pekalongan, Lasem, Tuban, and Madura. Unlike Yogyanese and Solonese batik styles, which heavily make use of dark brown colors in their design, coastal batik styles generally appear lighter. Coastal batik styles also use patterns and motifs that are heavily influenced by Indian and Chinese cultures, because historically, interaction between the natives and foreign traders occurred most intensively in those coastal regions. Despite the popularity of batik in Bali, Balinese people didn’t actually produce batik until recently, i.e. circa 1970s. There are not many distinctive features that Balinese batik offers, except that it uses patterns and motifs that reflect Balinese culture, such as Barong and Rangda. Modern Balinese batik even depicts patterns and motifs that symbolize modernity, such as buildings and sleek and straight lines. Sundanese batik distinguishes itself mostly not in patterns and motifs, but in color. While Javanese batik styles, be they coastal or inland, use various shades of red and brown as their primary color, Sundanese people prefer to use the shades of blue for their batik. Colors such as dark blue and indigo are considered dominant. If red is to be added to the design, they often prefer to choose magenta, which has an element of blue in it. There are two types of Sumatran batik that are considered popular: the one from West Sumatra or Minangkabau and the one from Jambi. The former is distinctive because it uses different techniques to make. In West Sumatra, a piece of fabric is immersed in a mixture of clay and water for approximately one day to colorize it. The drawing process takes place after the fabric is colorized, so wax is not involved in the process. Batik from Jambi is different because it uses traditional batik-making process; however, due to the strong influence of Islamic culture, the patterns and motifs mostly consist of Arabic texts. Other regions in Indonesia have their own unique fabric art. Although certain garments, such as Sasirangan in Kalimantan, have nearly the same patterns with those of batik, they are not regarded as batik variant because of the technique used to make them. Due to the variety of batik making techniques, all kinds of fabric can actually be used for making batik; however, to maintain quality and comfort, only a handful of fabric types are commonly used to make batik. Here they are. Cotton is especially favored for making batik because it is breathable, cool and comfortable, and capable to absorb sweat. There are several types of cotton that are commonly used for batik, including poplin cotton, which is thick and warm; mercerized cotton, which is favored because of its strength and lustrous appearance; dobby cotton, which looks and feels great due to its unique texture; and non-bleached cotton, which is a cambric’s variant called blacu. Being a comfortable fabric, cotton is a perfect choice for making Hawaiian shirts, quilts, and any other types of garment that directly touch the body. There is a large assortment of synthetic fabrics that can be used to make batik fabric, but the most commonly used one is rayon. Rayon fiber comes from the regeneration process of cellulose fiber. Rayon is favored as material for batik fabric because it nearly resembles cotton in terms of comfort and look. Rayon is also favored because of its shiny look and its draping characteristic. The draping effect of rayon makes it a perfect choice for making beach sarong and long dress. The draping effect prevents strong wind from causing trouble when the garment is worn. One important notice is that although having almost similar features to those of cotton, rayon is weaker than cotton, especially when exposed to water and alkalis. Silk, together with wool and felt, is possibly the only animal-based fabric that is commonly used for making batik. Silk becomes a highly demanded fabric for batik fabric because of many reasons. Firstly, silk appears beautiful and luxurious. Silk has long been regarded as the most beautiful fabric that people can wear, so it is not surprising if silk batik fabrics, despite their relatively expensive price, are always in high demand. Secondly, silk fiber is so strong that it is actually comparable with steel wire. Thirdly, silk is comfortable to wear. Silk fiber contains amino acid that makes the fabric soft and comfortable. Silk is also cool, breathable and able to absorb sweat. Lastly, silk is perhaps the only fabric that effectively protects the skin and the body against dangerous ultraviolet ray. Batik Fabrics is popular merchandise both in Indonesia and abroad. For this reason, its design inevitably has to follow the changing of fashion trends. In the past, batik fabric was known only in the form of shirts, shawl or cloth to accompany women’s kebaya. Today, batik is used even for making bikini. This kind of change occurs not only in the design. Therefore, in the future, we can expect the use of different materials, different patterns and motifs, and possibly different techniques in batik-making. Regardless, batik will remain Indonesian heritage whose popularity in different parts of the world will never wane.